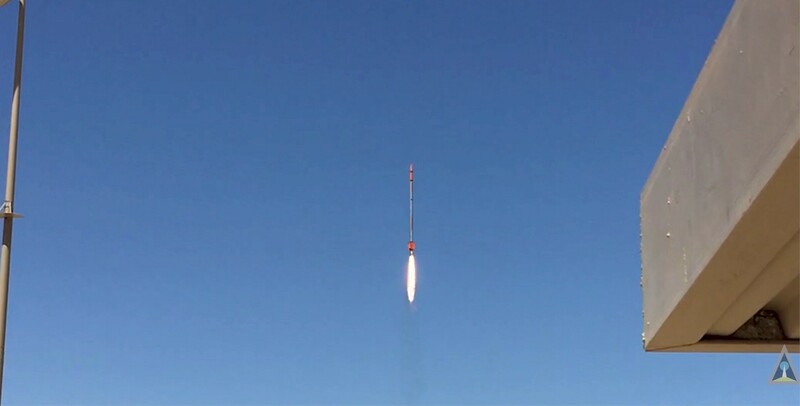 The IOS rocket team successfully completed a low-altitude flight-test of its orbital vehicle's liquid upper-stage rocket engine (GPRE 0.75KNTA). The engine was integrated into an IOS NEUTRINO sounding rocket. An improved main valve unit was installed that increased the propellant flow, boosting the engine performance higher than was achieved during static ground tests. The rocket generated 10 Gs on takeoff with a thrust of 900-lbs (4003.4-newtons) and a specific impulse of 248-sec. The ablatively-cooled rocket engine is powered by the hypergolic combination of White Fuming Nitric Acid (WFNA) and Turpentine/Furfuryl Alcohol. These high-density storable auto-igniting propellants power all IOS liquid rocket engines. This propellant combination generates a distinctive bright hydrocarbon plume similar to LOX/Kerosene. Interorbital's N1 and N2 orbital launch vehicles employ two GPRE 0.75KNTA engines for their second stage and a single GPRE 0.75KNTA engine for their third stage. The test launch carried three commercial payloads: All were recovered with the rocket by parachute and came back alive and functioning. Boreal Space of NASA Ames Research Center flew its Wayfinder hosted payload technology that contained experiments from Stanford University's Extreme Environments Lab, as well as a Graphene experiment from the University of Singapore. During the flight the NEUTRINO rocket achieved its expected altitude and the recovery system worked as designed. The rocket was successfully recovered and is being readied for a high-altitude test launch scheduled for sometime in the next few weeks.